This is the third book I have reviewed within a short period of time that uses a ‘tips and tricks’ approach so the same general words are in order. All these books claim that if you follow these tips you will end up as a winner at the poker table. Nothing could be farther from the truth. There are no magic formulae or secret tricks in poker that will make a loser into a winner. Struggling to win in low limit games is not because the player doesn’t know some tips and tricks but because the player doesn’t understand basic poker principles. What a novice or struggling player needs is a book that conveys a proper foundation. Having said that, I don’t think that books based a ‘tips and tricks’ approach are useless, I just think the target audience should be intermediate and advanced players where such a book can be helpful to fine-tune their game. 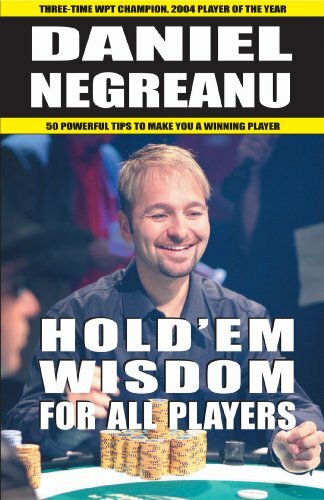 Though the title of Negreanu’s book is Hold’em Wisdom for All Players its clear that the book is directed at beginners (“I’m assuming that many of you reading this book would consider yourself a beginning or novice player,” p. 43). It contains 50 of Negreanu’s “favorite strategy nuggets” (p. 13) which means that, because the book is only 166 pages long, the chapters are usually only two to three pages long. In contrast to Isaac and Shulman’s book, the chapters follow no apparent order. The span of the treated topics ranges from stealing blinds and playing trash hands to setting up your own home poker tournament. The only shared factor that keeps everything together is the game: Texas hold’em. Most of the time Negreanu talks about no-limit tournament, then about limit hold’em and sometimes it’s not clear about which form he is talking. “If you caught that episode on television, you would have seen me make a miraculous prediction to finish off the match“ (p. 125). If you are curious what Negreanu is talking about in the last reference here is what happens. Negreanu was playing Jerry Buss, the owner of the Los Angeles Lakers, in the first round of the National Heads-up Championship. Negreanu went all-in with Q♦J♠ and Buss called immediately with A♦T♠. The flop came 5♣9♦T♦. Buss was leading with top pair top kicker while Negreanu had an open-ended straight draw. Negreanu called for the 8♦ on the turn and the J♦ on the river being correct both times. His straight flush beat Buss’ ace high flush. You see wishful-thinking players all the times but of course Negreanu is not one of them. “How did I do it? I have absolutely no idea. The odds of calling two consecutive cards are astronomical.” (p. 126) It was an amazingly fortunate turn of chance for Negreanu but not ‘astronomical.’ The odds to predict the turn and the river correctly are 1980:1 (there are 45 unseen cards, (1/45) x (1/44)), long odds indeed but definitively not astronomical. If I knew I would get these flops I would play these hands too (by the way the odds to flop trips with 6-7 are 74.2:1). Nearly all the hands Negreanu gives work only with these miracle boards. He is making the point that big hands made with small pairs or small suited connectors have the advantage that they are essentially ‘hidden.’ Additionally it makes the opponents less able to put you on hands because you are playing a wider variety of cards than the traditional player. At least Negreanu contradicts Doyle who thinks no-limit is the ”Cadillac of poker“. Quite correctly he points out that no-limit is not the most skillful form of hold’em, it’s pot-limit! Everybody knows that position is important in hold’em. Unfortunately Negreanu uses a poor comparison from blackjack to prove his point. This is completely nonsense. First, the dealer’s advantage is not “huge“, it’s even possible that the player has an edge, every casino manager knows this. Second, the dealer doesn’t react to what you are doing (“hit or stand”) because he plays with a predefined set of rules. If you have 12 and the dealer has 15, he still has to draw a card though he has you beat at the moment. The only advantage the dealer has is that if you both bust you lose your bet. That is indeed a big advantage and that’s the reason why there are several rules that favor the player (like seeing one of the dealer’s hole cards, splitting pairs, double down, blackjack bonus or surrender). If you are familiar with Tom McEvoy’s writing you know that he often refers to AK as a drawing hand. Negreanu takes up that assertion (”The important thing to understand about Big Slick is that it’s a drawing hand“, p. 69). I’ve read that statement many times but in my opinion it doesn’t make any sense. Every hand is a “drawing hand“ (with the exception of pocket aces) if a better hand is out. If you have KK and your opponent happens to have AA, well you have a drawing hand. Of course Negreanu is right that heads-up pocket deuces are a favorite against AK (p. 67). But that doesn’t make 22 necessarily a better hand. The question is will you ever see the river with pocket deuces? If you don’t flop a set you are always looking at three overcards. Most flops will look pretty ugly for your deuces. And if you have AK and your opponent doesn’t have a pair, he is drawing not you. I can’t remember how many times I won with unimproved AK. In chapter 38 Negreanu discusses collection games (games with a time fee) vs. raked games. His conclusion is: “If you have a choice, you should almost always go with a collection game.“ (p. 130) For a loose player like Negreanu this is definitively true. For a pro who grinds out his living expenses playing poker it’s mostly the opposite. At the Bellagio the time fee in the $30-60 game is $6 every half hour. I usually win between 2 and 2.5 pots that would be raked. The maximum rake at the Bellagio is $4 per pot. If we take the upper limit (2.5 pots won) I would pay $10 per hour in a raked game versus $12 in the time fee game. $2 every hour, every day, every month – that adds up. As long as it is a full ring game a tight player is usually better served with a raked game. All in all I was pretty much disappointed by Negreanu’s book. Its rather basic and if you find any “strategy nuggets“, good for you.